He said that AFPA has gained the support of the vast majority of the companies operating right across the forest industry value chain. The long battle to have rotational forestry accepted into the Emissions Reduction Fund is a good example of the resoluteness of this association noting that policy change of any note is a difficult process, requiring perseverance, determination and demanding an association deploy all the elements of policy making. In financial terms AFPA is in a sound position to the satisfaction of the auditors. Mr Hampton said that last year’s change to the AFPA constitution, to enable the four AFPA chambers to each offer up two participants to a vote at the AGM, has strengthened the board’s diversity and representational structure. “As I speak to members around Australia right across the value chain I gain a strong sense of optimism. We have some positive tailwinds,” Greg McCormack AFPA chair said in the report. 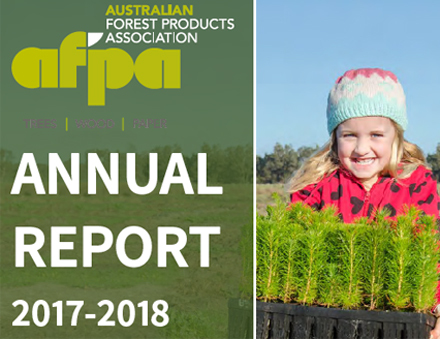 Mr McCormack said that AFPA was already starting to see more retail companies agreeing that proven sustainable management practices and chain of custody is important to the end user. He stressed that there remains serious challenges from vocal minorities to our sustainable use of native forests who misuse ‘half truth’ science to drive political outcomes which cost dearly. “Growing our plantation estate has been the number one goal of AFPA for the last several years,” he said. Subscribe to the FREE enewsletter, Daily Timber News, for current national and international timber industry news. Copyright © 2014 Ryan Media Pty Ltd (Division of Provincial Press Group). All Rights Reserved.